The 15th United Nations Climate Change Conference (COP15) in Copenhagen, which many have said was our last chance to take action against "the greatest threat the world has ever faced", ended in a failure. For over 15 years delegates and politicians from around the world have discussed, debated and negotiated the questions of dealing with man-made climate change in various COP (Conference of the Parties) summits. So why haven't they made any real progress yet? That is a big question that covers a whole range of topics and issues that I won't go into. Instead I will try to focus on the actual politics and tactics used at the COP summits. I will try to see if uneven development and inequality plays any part in how the actual negotiations plays out, how the delegates attending perceive climate justice and fairness, and if all this combined somehow sabotages the efforts to secure a climate deal. At the major United Nations Earth Summit in Rio de Janeiro, Brazil, in 1992 more than 100 world leaders met to address the question of global climate change. At the end of the conference 187 nations signed the United Nations Framework Convention on Climate Change (UNFCCC) treaty. Without any "tough details" the agreement said nations should "protect the climate system"¦on the basis of equity and in accordance with their common but differentiated responsibilities and respective capabilities." World leaders managed to get a consensus and reach an agreement but they still had disagreements on what kind of responsibilities nations had under the UNFCCC treaty. The "common but differentiated" phrase seems to have resulted in various different interpretations between the "North" and the "South". The poor developing nations were, compared to the North, very precise in their interpretation of the phrase and called for the rich developed nations to take the lead in the emission reductions. They also wanted the North to help developing nations in their environmental efforts by transferring large amounts of economic and technologic assistance from the North to the South. The North on the other hand interpreted the phrase a bit differently. According to the UNFCC treaty $625 billion was needed every year for a sustainable development to take place in the developing nations. Around 20% of the money would be paid by below-market loans to the South. But the developed nations never fulfilled their promise of economic and technologic assistance to the South. In the end they paid less than 20% of the $625 billion. In 1995, three years after the Rio Earth Summit, the first COP conference took place in Berlin, Germany. Here the so called "Berlin Mandate" declared that the developed nations in the North should reduce their emissions first while the developing nations would join in later on. Two years later in 1997 at the COP3 conference in Kyoto, Japan, the US president Bill Clinton actually signed the famous Kyoto Protocol, which called for binding reductions in greenhouse gas emissions. But the protocol was never ratified by the USA because of the US senate which voted unanimously in favor for the Byrd-Hagel Resolution. Once passed the Byrd-Hagel Resolution successfully blocked any climate treaty that was, in their words, "unfair". Because the Kyoto protocol did not require the developing nations to do any emissions cuts the US senate felt it was "unfair" and refused to ratify it. And it is now, with the Kyoto protocol, that you can start to clearly see the different positions and opinions the North and the South, rich and poor, developed and developing nations have on what climate justice actually is. Developing nations didn't want to accept any scheduled emission reduction targets for the future. Any mention by the North that the developing nations should in some way slow down their development and economic growth by limiting their greenhouse gas emissions was met with an "openly hostile negotiating environment" from the South. The Brazilian ambassador Luis Felipe Lampreia stated during the COP3 conference that: "We cannot accept limitations that interfere with our economic development." And the lead negotiator from China said: "In the developed world only two people ride in a car, and yet you want us to give up riding on a bus". The developed nations are responsible for about 80% of the worlds CO2 emissions. One person in Bangladesh will during a whole year emit as much CO2 emissions as one average person living the UK will in only 11 days. A single power plant in Great Britain will produce more CO2 emissions, every year, than all 139 million people living in Uganda, Kenya, Tanzania, Malawi, Zambia and Mozambique combined. It is also clear that developing nations are much more vulnerable to the effects a changing climate brings such as droughts, rising tides, floods and tropical storms than rich and developed nations are. And nine Chinese and eighteen Indians release as much greenhouse gas emissions into our atmosphere as one average American does. The USA is alone responsible for over 20% of global greenhouse gas emissions, but only around 4% of the world's total population lives in the USA. A whopping 136 developing nations are on the other hand together responsible for 24% of global emissions. But the former US President George H. W. Bush once notoriously stated that "the American lifestyle is not open to negotiation". His son, George W. Bush later dismissed the Kyoto protocol completely by claiming that the treaty "would cause serious harm to the US economy" and that it is "an unfair and ineffective means of addressing global climate change concerns". Even in light of these clearly uneven numbers the North's perception of climate justice seems to be to disregard any kinds of historical responsibilities or economical differences, the very same issues that the South thinks are the basis of climate justice. And these rather different perceptions on climate justice between the rich and poor nations help fuel an deteriorating negotiating atmosphere. When it comes to the negotiations during these summits, like the COP15 this past December, the income differences between developing and developed nations plays a big role in creating a hostile negotiating environment for the delegates. It is also one of the more direct examples on how inequality can dampen cooperation on climate change. Attending these yearly COP summits obviously costs money. Nations need to be able to pay for their delegate's salaries and accommodations. Other costs involves scientists, lawyers, translators, economists and consultants that can help the nations delegation in the actual negotiations, with their draft proposals, legal argumentation as well as being able to offer counterarguments and proposals to the demands of other nations. "The reason why many poor small countries are hardly represented in negotiations that concern them directly, writes Robert Wade, is that they cannot afford the cost of hotels, offices, and salaries in places like Washington DC and Geneva, which must be paid not in PPP [purchasing power parity] dollars but in hard currency bought with their own currency at market exchange rates (quoted in J.T. & Parks, 2006: 15)." Unfortunately many of the less developed nations (LDCs) cannot afford all this and most of the time they will have to go without this much needed help. Just a little side note to show how just bad these things can get: At a seminar in the aftermaths of COP15, at the Lund University in Sweden, a CPS student from Bangladesh told us about how he had, at a visit to the Bella center (where the climate talks were being held), walked into the delegation from Bangladesh. And after a short chat with them he ended up helping the delegation with translations at the big UN summit. The delegates also need to attend all the formal and informal meetings during the climate summit. And these can be many and scheduled to take place at the same time. If you have several delegates you can easily divide up the work and focus on certain issues, read every single document and draft texts. That's why the more delegates you can send the better. Studies have shown that there is a great difference between the numbers of delegates developed and developing nations are sending to these COP summits. For example: To COP6, in the Netherlands, the USA sent 99 delegates and the European Commission sent 76 delegates. Many developing nations such as African and small island states were lucky if they could even afford to scramble together a delegation consisting of one to three delegates. Recent studies and experiences at COP10 in 2004 confirm and back this up. During COP6 the chairs decided to split up the negotiations into smaller groups, subgroups and even subsubgroups so that they could easier cover all the climate related issues in an easier manner. Sure, this move can in an equal and perfect world make the debates and meetings flow much smoother. But with the current inequality between developed and developing nations it can make things worse. As you can imagine this decision gave a huge advantage and "agenda-setting power" to the developed nations who had been able to send many more delegates to the COP summit than the poorer nations had. Another problematic side effect of not being able to send enough people to the climate summits is that the developing nations delegates often gets "buried" in documents and papers. This of course leads to the delegation losing its strength and energy. In the last hours of the summit they could then be presented with a document or proposal to a treaty which is already done and beyond alteration and forced to accept or reject it in an unrealistic short period of time. The developed nations use this to get a tactical advantage of the developing nations. They can offer a document at the last hour and pressure everyone to sign it. If the developing countries don't accept it they are later labeled by the developing nations as the "bad guy" and the ones responsible for wrecking the climate talks (Huffington Post, 2009). At COP6, for example, "commitments were imposed by muscular chairmanship, or gaveled through without reaction from negotiators exhausted to the point of sleep," Ashton and Wang claim. But this approach does not always succeed as can be seen by the walkout by G77 delegates in 2003 at the Cancun trade negotiations, or from the failure of the COP6 summit where China and the G77 group felt marginalized by the developed nations. 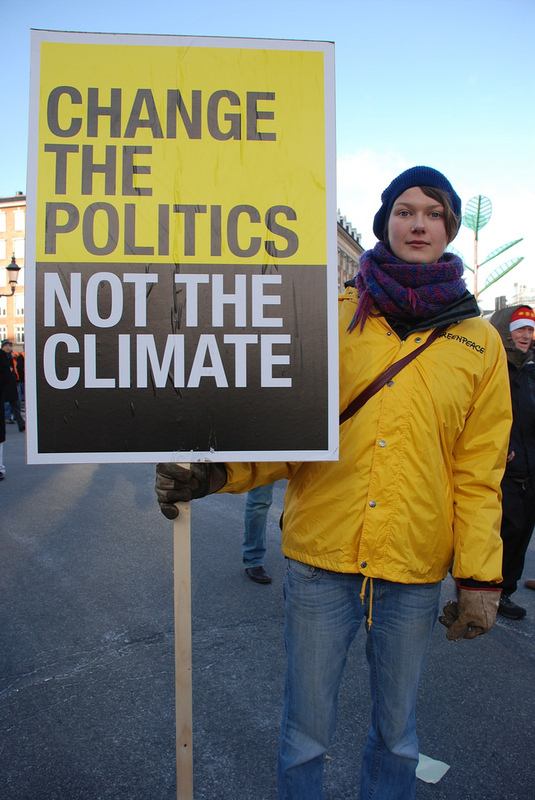 Or from the walkout by African nations at the latest COP15 summit in Copenhagen. "The global community trusted the Danish government to host a fair and transparent process but they have betrayed that trust. Most importantly, they are betraying those who are disproportionately impacted by climate change and whose voices are not being heard. This unfair behaviour strikes a blow to all efforts to achieve justice and equity in the climate change negotiations process (quoted from Friends of the Earth, 2009)." "This was the chaotic, disastrous denouement of a chaotic and disastrous summit. The event has been attended by historic levels of incompetence. Delegates arriving from the tropics spent 10 hours queueing in sub-zero temperatures without shelter, food or drink, let alone any explanation or announcement, before being turned away. Some people fainted from exposure; it's surprising that no one died. The process of negotiation was just as obtuse: there was no evidence here of the innovative methods of dispute resolution developed recently by mediators and coaches, just the same old pig-headed wrestling." One also need to keep in mind that local environmental problems such as preventing soil erosion, providing clean drinking water, treating sewage and slowing down the spread of deserts are for most developing nations a much more critical and pressing issue than the more global ones. For developed nations the more global environmental issues such as climate change, ozone depletion and habitat loss are higher up on their priority list. This means that the developing nations need to put more effort into pursuing the South that the global issues should be a higher priority for them. At the same time many delegates and policy makers from the less developed nations fear that the nations in the core of the world system, which I explained earlier, might just use the climate and environmental concerns to cover up their real agenda: keeping the periphery nations underdeveloped. After being literally forced to accept trade-related, intellectual and property-rights laws and agreements that gives an advantage to the North many South policy makers and even academics hold this opinion of mistrust. And this is a reason to why there is such a big "climate of mistrust" at the COP negotiations. The North has almost constantly failed to keep their promises of financial aid, technological transfer, ignored many of the ecological problems in the South and used tactics to marginalize the South at negotiations. So it's not really that hard to understand that any suggestions from the North that the South should limit their development, for the good of global environmental issues, are met with a dismissive response from the developing nations. So the lack of power and the extreme poverty and underdevelopment among many of the developing nations leaves them vulnerable in negotiations with the North. It's more expensive for developing nations to purchase environmental technology and knowledge as they have to be paid with real cash and not credits or loans from the North. This makes it hard for them to perform any kinds of meaningful emission reductions or take part in the COP summits on equal terms. The wealthy developed nations believe that climate justice is when an agreement involves all parties, both developed and developing nations. Because, they argue, the non-Annex I nations will in a near future increase their emissions with so much that they must be included in a climate treaty. The poorer developing nations on the other hand perceive this in another manner. The climate crisis is a result from the rich North's excessive consumption. And so they argue they also have the right, just like the North, to build and develop their economy using cheap fossil fuels. The ozone layer crisis during the 1980's is a good example of how the world can come together to combat global environmental issues. The negotiations back then was just as hard and complex as the climate talks are today. During the negotiations a Chinese delegate said that: "The call for modernization is so irresistible that China will continue to produce these ozone depleting chemicals," unless, of course they and other developing nations received financial compensation for their efforts. India was equally tough in their negotiations and their environment minister said in a statement that: "We didn't destroy the layer. You did. I'm saying that you [the West] have the capability and the money to restore what you have destroyed" (Do you recognize the style of the statements back then to the ones in today's climate debate?). In the end the North agreed to give financial aid to the developing nations so that they could afford to take proper actions and protect the ozone layer. But the current climate change negotiations are taking place in an even tougher "climate of mistrust" between the rich and poor. This mistrust is based on decades of Western promises not kept in global environmental and economic matters. To get rid of this suspicion and mistrust that is sabotaging efforts to secure a climate deal the North needs to understand their historical responsibility in this matter. As well as taking social and economic issues into account when negotiating about climate targets. The North could do this by offering a new and fairer global environmental and development treaty that clearly shows their commitments in this issue. "They could do this by providing greater "environmental space" to late developers, supplying meaningful sums of environmental assistance, funding aid for adaption and dealing with local environmental issues as well as global issues like climate change, and by identifying and investing in win-win technologies and sectors that both address local environmental issues and reduce greenhouse gas emissions (quoted in J.T. & Parks, 2006: 217)." Basically the North needs to stop treating the weaker nations in the South as "second-class citizens" and work on rebuilding the South's trust. Until they do we won't get a fair, ambitious and binding climate deal (Or a planet with a habitable biosphere!). Roberts, J.T. & Parks, B.C. (2006). "A Climate of Injustice: Global Inequality, North-South Politics, and Climate Policy"
The US has too much to lose, and the powers that be want the power structure to remain as it is indefinitely (http://greenplanetethics.com/wordpress/2010/02/...). I am curious as these new green technologies come will they be owned by people who don't want to share? Patents can be used to prevent other from using a new technology. These guys say patents are good for the advance of green tech - do you agree? It's important to remember that it's not just about money. What about all the different cultures that are lost when islands and nations such as the Maldives disappears due to man-made climate change? How can you re-locate a nation or a people? here in France - I am encouraged by generation of electricity without coal or fossil fuels. Nobody likes nuclear - but it sure is green compared to China's coal problem. You're a true inspiration to me. Thanks! Your article rocks and is really a very good understand!